Ahmed Deedat | Is the Quran the Word of God? 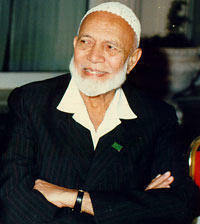 Ahmed Deedat (1918-2005) was one of the most influential Muslim missionaries and polemicists of the twentieth century. He founded the Islamic Propagation Center in 1957, and his debates and writings continue to circulate around the world. Deedat’s methodology and argumentation have influenced other prominent Muslim polemicists in the twenty-first century. According to one writer, “He [Deedat] can hardly qualify as a ‘thinker’ in an elitist, academic sense. As a rule, however, his influence is probably much greater than that of academically trained intellectuals…” 1David Westerlund, “Ahmed Deedat’s Theology of Religion: Apologetics through Polemics.” Journal of Religion in Africa, 33(3) 2003. … we have heard the Islamic viewpoint put forth by Mr Ahmed Deedat. Now I want to ask first something, this: Do you believe what Mr Ahmed Deedat said? (Loud roar: YES). I ask any Muslim to stand up here tonight and to tell me that the Qur’an does not say that Christ was never put on a cross, that in fact it was someone else, am I not right? Does the Qur’an not say that God took Jesus up to Himself? Does the Qur’an not say that God protected him? Does the Qur’an not say that God made someone else look like him? Does the Qur’an not say that God put that man on the cross? What do you believe? Mr Deedat or the Qur’an? (Loud answer: the Qur’an). …the huge Muslim audience was struck to silence and to defeat, which the Muslim did not readily accept. So the Muslim audience at one moment in their frenzy roared that Mr Deedat was right, and the next when the truth was pointed out to them from the Qur’an, then they answered that the Qur’an was right, which in fact shows in what a humiliating position they were put through the crucifixion arguments put forward by Mr Deedat. (Muslim Digest, March 1977; quoted in “Deedat in the Balance”). ___________, Is the Bible Gods Word? Ahmed Deedat: Great Islamic Scholar of the Bible? 1. ↥ David Westerlund, “Ahmed Deedat’s Theology of Religion: Apologetics through Polemics.” Journal of Religion in Africa, 33(3) 2003.